We all know American president Donald Trump is the master of tweets and whenever he tweets it's always spectacular. 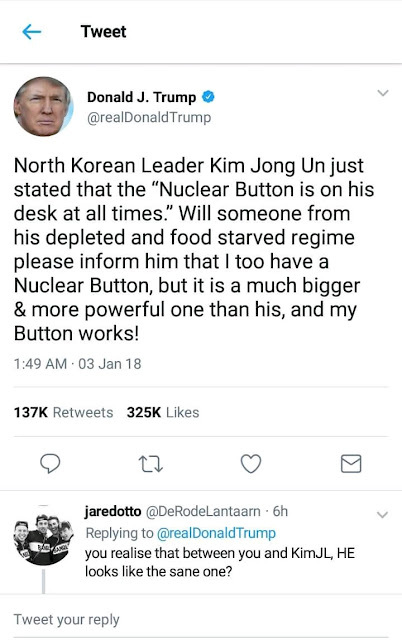 But it seems someone else stoke the show after he tweeted a response to North Korean supreme leader who threatened the nuke button is always on his table. President Trump tweeted: "North Korean Leader Kim Jong Un just stated that the “Nuclear Button is on his desk at all times.” Will someone from his depleted and food starved regime please inform him that I too have a Nuclear Button, but it is a much bigger & more powerful one than his, and my Button works!" But the reply he got from a follower has seen hundreds of retweets.